Food Blogga: It's a Food Blogga Give-Away for Clementines from Spain! It's a Food Blogga Give-Away for Clementines from Spain! Nothing brightens a gray winter day as deliciously as citrus does, especially clementines from Spain. The smallest variety of mandarins, clementines are exceptionally sweet and juicy. Since they're both easy to peel and seedless, they're ideal snacks for kids and for adults on-the-go. Just tell me why you'd like to win the clementines from Spain by the end of the day, Tuesday, January 27, 2009. With the help of random.org, 5 winners will be randomly selected and announced in a future post, so please check back. My apologies to my international readers, but winners are limited to U.S. residents. Winners will need to provide their real names and mailing addresses. Don't have a blog? Just leave an active email address where you can be reached. Good luck, everybody! Clementines are my absolute favorite fruit! And the vitamin C really couldn't hurt in the winter. Thanks for doing this! I would love to win clementines ,mainly cause I've never had them before! We adore these wonderful little fruits. So refreshing, so portable one can easily grab 1 or 2 or...greed is the only problem. My son set out for school with 4 of them in his pockets the other day. And adding the words "prize" and "free" would be about the only way to improve them. They're one of my favorite snacks, so I'd adore to have a box to munch on. I have never tried Clementines! Neither have my kids. I would love to win them and have a fabulous fruit fest with the kids. I love love love clementines. On one particular occasion we had movie night and while everyone was munching on popcorn, I polished off an entire bag of these sweet little cuties. Never tried the spanish ones, but I'm sure they're just as delicious! Of course I'd love to have them Susan...never had clementines, & all the way from Spain. But als, no US address...*SIGH*... will my sis's address in Hou do? Oh what a marvelous giveaway, my family and I would love to win. Oh I love little Clemmies! These are so sweet and EaSy to peel! I'm a vegetarian and LOVE my fruits and veggies, but these cutties are one of my favorites! I'm from Florida, but now live in Michigan, and one of the things I miss most is great citrus. I'm curious how the Spanish clementines compare to the ones that I'm used to. I would love to try them! There's nothing like an in season clementine! I love the flavor, and I love how easy they are to peel. Thanks for the chance to win! I would love to win these clementines. They are such a wonderful fruit - sweet, juicy, easy to peel, seedless, and delicious! Winning these clementines would help us keep our resolution to eat in a healthy fashion! Thanks! There is nothing like a sweet clementine. They are the best. I would love these! Who would say no to Clementines from Spain! I'd like to win because I loooooove clementines! Clementines are my favorite winter fruit. And Spanish clementines? Muy bien! I would love to win the Clementines. I really like them a lot, but they are my husband's absolute favorite fruit. Only one reason why? Clementines in general, and citrus in the winter... both make me drool. We just finished off a Costco-sized flat of oranges so these Clementines would be just in time! I would love to win some clementines. They can be expensive though at the grocery store. I don't know if the ones I bought recently were from Spain. I've never had a clementine, so this would be wonderful. Clementines from Spain sound so intriguing and they look juicy and sweet. They are very sweet and juicy. Good food makes one become very mindful about the little slices of heaven we have on Earth! Why I'd like to win them because they're delicious. Clementines are soo good.... love them! Winter is getting to me. I could use the sweetness, the vibrant color, and the Vitamin C. What a great giveaway! I love clementnes. They are so sweet and the perfect size for a citrus fix. Thanks for the giveaway. Oh my darlin' I would love to win some clementines from Spain, because I've never had any from Spain before! I would love to win clementines as they're really sweet, so adorable, fresh in ur picture and I never tried before. It's very hard to get like this fruit here as they're from spain. I've never had a clementine before but I 'd love to try them. It has been snowing or icy or grey for over a month - I NEED some sunshine - clementines will do it! Thanks for the contest. I have been eating clementines like candy lately. I think I've eaten 2 boxes practically by myself! And I just ran out! I would love the 5 pound supply of clementines in order to create a version of the clementine cake. Thanks, and I can be reached at maishaheatley(at)gmail(dot)com. We are fruit lovers and my husband especially loves oranges, so this would be a great prize to win. Thanks! Fresh fruit, added vitamin C, and having it in the middle of winter! It doesn't get much better than that! Thanks for the giveaway opportunity. I love clementines, and your blog! I would like to win these clementines so that I could give them out as Valentines! Because all the clementines I've purchased so far have been flavorless and shrivelly...These look DIVINE!!! Delicious. This would be so wonderful to receive fresh instead of getting from the store where they've sat a while. I would love to win since I can't afford to buy clementines in the store and they are so super delicious! These little bits os sunshine will help fight off the scurvy! My birthday's in a few weeks and these would make a fabulous treat to share with my coworkers. We all complain about the amount of celebratory junk food we're "required" to eat! Would luv the clems..they would go great with Batali's orange crocs while I'm reading his new cookbook "Spain", A lCulinaruy road Trip Mario Batali with Gwyneth Paltrow." Xcuse the plug but this is the first cookbook I've "read" from cover to cover. I would love to win a box! I've seen in the blogs, and even at Trader Joe's the other day, but have never had one. I love citrus fruits, and since they're so small the kids would love them! Citrus captures the warmth and color of Spain so wonderfully! If we had a box of these it would be a wonderful reminder for Papa who is from Spain and a delicious way to continue to share his stories and memories with our two little boys. We try to teach them as much as we can about that sunny culture, but we live in a cold, gray northern climate now, and it seems so far away, especially in winter! Clementines are absolutely delicious! Clementines from Spain?! I would bet anything that they are even better. Clementines are the most perfect food. They are eco-friendly, (no plastic bag needed, deposit rinds in ground to nourish soil.) They travel well in a bag or pocket, not easily squished. They provide a sweet pick me up in the middle of the day. They are nutritiously delicious. They are so cute that just looking at them can make you happy. i would love to win these clementines because i am obsessed with spain and all things spanish. i would be super excited to have a box of these! what a great giveaway. These Clementines would be an awesome addition to my Wednesday night tapas. How about if I sing "My Darlin' Clementine?" Or maybe you would want to send them to me to keep me from singing! I have never had a clementine but Looove citrus fruits. I think it's time I try them. Clementines are delicious! And it has been ages since I have had any. I would love my daughter to be able to try them, it would be a much healthier snack than sugar laden treats. Thanks for the chance to win! Mmmm...I'd love to win because Clementines are one of my favorite fruit. They are so easy to peel and they taste so good! Crazy timing here ... I just came back from our local Clementine Farm with a bag full of juicy delights. Please leave me out of this contest, as I'm lucky enough to have a local supply, but good luck to everyone commenting! Mmm...these are good enough to come out of the shadows of lurkage. Clementines are quite possibly my favorite winter fruit, with each section like a little flavor bursting packet. Thanks for posting this chance to win some tasty citrus! I'm crossing my fingers. Ha! Great idea for a prize Susan. How I love anything orange. I'll resist entering simply because I may eat them all at one sitting and regret it in a severe way. Hope you'll enter my Super Bowl Recipe Giveaway... you can win a $250 gift card!! My family LOVES clementines! It will make the Ohio winter seem like summer time :) Thanks for the chance! I have loads of recipes for clementines! I somehow missed my local grocer carrying Clementines this year. It was awful. It'd be great to win these. Thanks. Nature has made the perfect fruit in clementines. It is so easy to savour their juicy flesh.I was the lucky recipient of Iberian Acorn Ham from Spain so would love the opportunity to try their clemetines if I can't head to Spain to try them myslef. because I just cut into the most dreadful orange from the grocery store down the street... :( I miss good produce and there is nothing like a goog clementine! yum! I'd love to win them!! I need good citrus in my life to remind myself that there is something to winter other than this BLASTED COLD WEATHER!! Thanks for the chance! I would love to win because I don't know if I have ever had a clementine. My sous chef would love it, she's into any fruit that peels! Can't think of anything that would taste any better during the long Maine winter months. Somehow it warms my soul and adds to our health! Thanks for this opportunity to blog about a great product. I would love to have these because it would keep me from eating all the cookies I still have in the house from Christmas! Plus I'd love to make Clementine Cosmos. Yum. I love Clementines and it would feel like spring at my house if I did win! Clementines are such a tasty fruit bursting with thoughts of sunshine and warm weather! I'd be thrilled to win a box for my house! I love clementines! The ones sold in the stores here though are so icky...not good. I grew up with a mom that stocked the fridge full of citrus and that is what we snacked on all day. I could eat it all in one day! To tell the truth, I've only tasted really good Clementines once in my whole life. It was an experience I've never forgotten! I'd LOVE to win this! Heidi emailed me her entry. Martha emailed me her entry. Martha K emailed me her entry. Love the fact that clementines not only taste good but are healthy too. I am born and raised in Florida, so I feel a bit like a trader, but Clemintines? It does'nt get better than that! My middle name is Clementine! Not really, but I would love to be named after something so wonderful...small, sweet, understated, Spanish!, easily peeled...we're getting into dangerous territory. This give away is wicked awesome Food Blogga! I'd like to win because I looooove clementines and I'm trying to be better about eating lots of fruit this year! I would love to bring a little bit of Spain into my house. They look delicioso! I would love to win these clementines because Ive never had one! I tried cherimoyas the other day for the first time from your advice and LOVED them! So I am going to take your word about these too! Because my son is studying in Spain right now and it would make me feel closer to him. B/c I love clementines to take to work -- very portable and tasty. I love clementines. I've never had Spanish ones, just Californian and Chinese. It would be fantastic to try them and see the difference. Mmmm...my children (and I) love clementines. Anytime I bring some home, they're gone in no time. Thanks for the chance! I would love to try some from Spain, plus Vitamin C is very important (especially during cold season)! Never tasted clementines from spain. I love clementines. They are sweet, they are a little sour sometimes. They are like perfect little jewels. Because I'm feeling lucky. And, love clementines! Clementines are just the best treat! They scream warmth and sunshine! Here in Maine it was 16 below this morning so anything sunny and sweet would be great! Thanks for the chance to win! I need my vitamin C! And I just saw a recipe for clementine cake I'd love to try. I'm in Rhode Island and we're expecting another snowstorm tomorrow - I could use a dose of lovely citrus to brighten things up! Because I've never had clementines from Spain...and I would share them with my daughter when she visits because we are fruitaholics! I would love to have a box of these clementines because I haven't had them in years. I can't find them in my neck of the woods. Also, my son enjoys trying new things and would love to taste Spanish clementines! We used to take clementines to school for lunch all the time. So much easier to peel than a navel orange! And sweeter. Now we can just think of 100 recipes that would be perfect for a clementine. 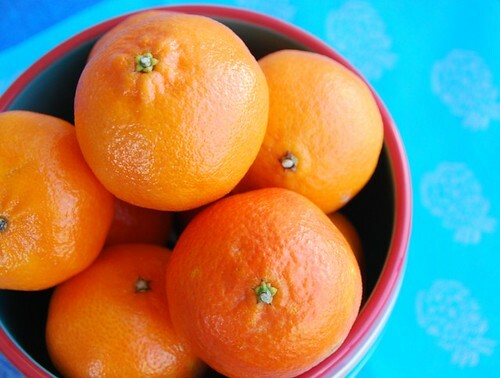 Would love to win a big box of clementines -- my 4 yr old and 2 yr old love this perfect tiny fruit! better than a trip to Florida! I would love to try these Spanish clementines and cook with them! Definitely don't have these readily available near me. Thanks for the opportunity! Squeeze, add Vodka and you have a taste of sunshine to serve your guests at cocktail time! So much better than orange juice. Want me some juicy sweet Clementines 'cos I got a cold in my nose -- and my chest and my eyes and all over da place. I coughfa coughfa coughfa. So tired of being sick. Clemmies lookin' soooo good. Luscious Clementines, love 'em! I want to win them so I can eat them, of course! Ruth emailed me her entry. Annika emailed me her entry. Linda emailed me her entry. I want to win these because they look sooo juicy and they are my daughters favorite fruit. I would love to win these...I can almost smell them and just looking at the picture I began to salivate! They are delicate and luscious! I need to have them pass my lips! I love eating clemetines as if they were candy. :) They are always a treat. I'm having a hard time eating healthy - I crave sweets - maybe clementines would satisfy that craving. Hope I win! I just love clementines...and these look awesome! And my reason: our dining hall is making cuts due to financial straits: no paper cups, no cereal at lunch or dinner and, worst of all, fruits only at breakfast and lunch! Clementines are the perfect healthy snack! I just adore the little guys!! What a fantastic giveaway! Thank you! Clementines would bring a bit of sunshine to this harsh Chicago winter. They would cheer me up and help provide much needed vitamins as I try to stay and get more healthy for my upcoming wedding! Thank you for offering this great contest! My girls and I love to eat clementines together. They're sweet, and easy to peel. My kids feel like they can prep their own food! The last day of this contest and I'm still hoping to win. Thanks for the opportunity. Great product. Oh my darling, I do not want to lose this Clementine on Valentines! What a perfect giveaway! Is there even a reason for NOT wanting clementines from Spain? I think not. They are the juicy mothers of sweet bliss. I would love to win this because I first tasted these in Spain while driving to our casa rural, my first time in Spain, and the taste was so explosive, it was almost impossible to drive, we had to pull over, it was so intense. An experience I thought I'd never have a chance to experience again in this life. 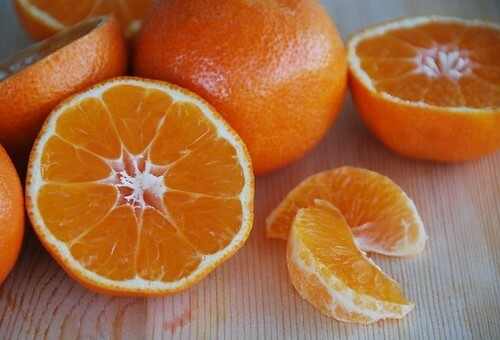 Your picture is making me drool; I'd love some clementines.I also love your blog! 2 weeks ago I sent my husband shopping and asked for clementines. He came back with... nectarines. I supposed I should be glad it wasn't aubergines! !